Two security researchers have demonstrated security vulnerabilities in the Nissan Leaf electric car by using mobile management APIs supplied by the car manufacturer. The unsecured APIs allow anyone who knows the VIN of a car to access non-critical features such as climate control and battery charge management from anywhere across the Internet. Additionally, someone exploiting the unauthenticated APIs can see the car's estimated driving range. "The other main concern here is that the telematics system in the car is leaking all of my historic driving data," one security expert said in a blog post. "That's the details of every trip I've ever made in the car, including when I made it, how far I drove and even how efficiently I drove. This could easily be used to build up a profile of my driving habits, considering it goes back almost 2 years, and predict when I will be away from home. This kind of data should be collected and secured with the utmost respect for my privacy." Vehicle Identification Numbers are easily visible through a vehicle's windshield. In a blog and embedded video, the security researchers, Scott Helme and Troy Hunt, described the discovery by a third unnamed person who'd been attending a security workshop with them. Hunt, who is from Australia, then demonstrated how he was able to access Helme's NIssan Leaf -- even though he was 10,000 miles away in England. "What the workshop attendee ultimately discovered was that not only could he connect to his LEAF over the internet and control features independently of how Nissan had designed the app, he could control other people's LEAFs," Hunt wrote in the blog post. 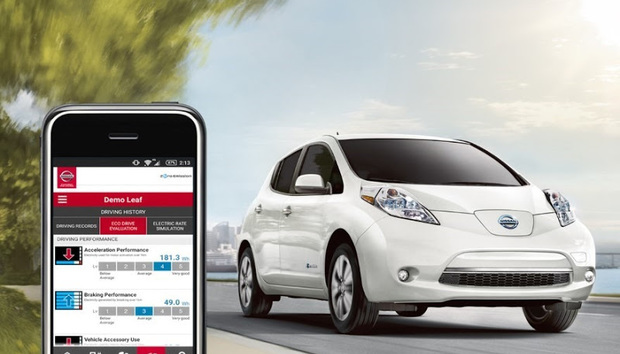 The APIs used to access Nissan Leaf cars work with Android or iOS devices. The security workshop attendee, Hunt wrote, went back to his hotel room the first day and proxied his iPhone via his PC, using Fiddler debugging software. "This takes a few minutes to setup and effectively what it means is that he can now observe how the mobile app talks to the online services. Jan then fires up the NissanConnect EV app. While Hunt said the vulnerabilities could not be exploited to create a life-threatening situation, hackers could use the NissanConnect app to do things such as run down a vehicle's battery. "It's much like being able to start the engine in a petrol car to run the AC, it's going to start consuming the fuel you have in the tank. If your car is parked on the drive overnight or at work for 10 hours and left running, you could have very little fuel left when you get back to it.... You'd be stranded," Hunt wrote. In an email reply to a Computerworld inquiry, Nissan said it is aware of "a data issue relating to the NissanConnect EV app that impacts the climate control and state of charge functions." The company said the "data issue" has no effect whatsoever on the vehicle's operation or safety. "Our global technology and product teams are currently working on a permanent and robust solution," a spokesman wrote. "We are committed to resolving the issue as a matter of priority, ensuring that we deliver the best possible experience for our customers through the app now and in the future." In an interview with the BBC, Hunt said the right thing for Nissan to do would be to turn off the app altogether. "They are going to have to let customers know. And to be honest, a fix would not be hard to do," Hunt said.